Lately, I’ve fallen in LOVE with M Café’s Kale with Spicy Peanut Dressing. (I honestly can’t get enough of it.) Besides being delish, kale is also one of those super foods. Kale is considered to be a highly nutritious vegetable with powerful antioxidant properties, and is considered to have anti-inflammatory properties. 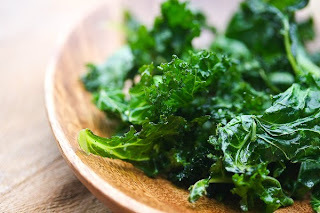 Kale is very high in beta carotene, vitamin K, vitamin C, lutein, zeaxnthin, and reasonably rich in calcium. Because of its high vitamin K content, patients taking anti-coagulants such as warfarin are encouraged to avoid this food since it increases the vitamin K concentration in the blood, which is what the drugs are often attempting to lower. 3. Drizzle the dressing on top of the Kale and mix the kale and dressing together until kale is evenly coated. Garnish with sliced red onions and chopped peanuts. *Makes enough to dress 2 large bunches of kale. Stores well refrigerated for up to 6 weeks. *For more healthy, yummy recipes, join my FREE digital magazine, Make Healthy A Lifestyle @http://www.LindaLaRue.com/members. my favorite dish at mcafe! thanks for the recipe! I just mixed up this dressing and can't stop tasting it. Very tasty! I added a couple more tablespoons of hot water as it seemed a bit too thick. Pairing the salad with a chard tart tonight for a super double awesome green experience. Here's the recipe if you'd like to try. I usually include the stems and saute them with some onion, leek, another veg, whatever I have on hand. I also like to mix goat cheese and parm and sometimes gruyere. Yum.